LOUISVILLE Have you ever thought about the technology that powers wireless, motion-sensing gaming systems like the Nintendo Wii or the way your smart phone knows whether you are holding it vertically or horizontally? Now, a far cry from entertainment and social uses, these features are being put to work in the treatment of chronic pain conditions. In November 2011, the Food and Drug Administration (FDA) approved the AdaptiveStim™ with RestoreSensor™ neurostimulation system from Medtronic, the first of its kind to receive FDA approval. 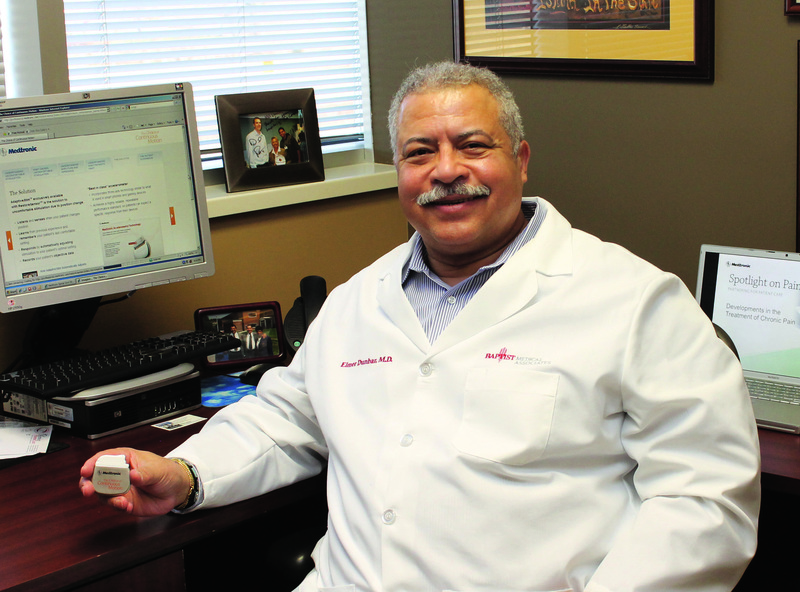 Elmer E. Dunbar, MD, pain management specialist with the Baptist Center for Pain Control (part of Baptist Medical Associates), implanted the AdaptiveStim device in a female patient in early February 2012. Neurostimulation therapy has been around since the 1980s and uses an implantable spinal stimulator to send electrical impulses through the spinal cord, interrupting pain signals to the brain, and replacing the pain with a tingling sensation called paresthesia. “The standard of care has been to place electrodes in the epidural space and then connect them to a power source, analogous to a cardiac pacemaker,” Dunbar explains. The conventional devices are not rechargeable and have a battery life of anywhere from three to seven years. Settings correlating to a patient’s position or activity are programmed into the generator, and the patient manually switches programs through a patient programmer. “So with each change of position, the patient needs to adjust the amplitude to compensate for the amount of distance between the dura and the spinal cord itself,” he says. The changes can be almost shocking and uncomfortable, and some patients have as many as 32 programs, requiring a great amount of recall and often resulting in confusion, dissatisfaction, and reprogramming of the device. AdaptiveStim follows the same principles of spinal cord stimulation but is controlled in a revolutionary way. “This is a major advancement in spinal cord stimulation,” says Dunbar. With AdaptiveStim, a programmer initially interacts with the device to apply appropriate amplitude settings for various activities. The difference is, using motion-sensing technology, the device actually learns the patient’s movements, adapts settings based on that information, and begins to remember it. The device is rechargeable and is predicted to last seven to nine years. By her third week of implant, Dunbar’s first AdaptiveStim patient, with just a new battery and new leads and before the AdaptiveStim had even been turned on, was already giving the device rave reviews. Eight years ago she received an implantable spine stimulator after two back surgeries and failed treatment with narcotics, anti-inflammatories, anti-epileptic medicines, and physical therapy. She had great results with the older iteration of the device, but says there is no comparison between it and the AdaptiveStim. “I had the opportunity to to ask her today what her pain score was, and she almost cried and said ‘I don’t have any pain,’” says Dunbar. The device is implanted through an outpatient percutaneous procedure with a two-inch incision. Dissecting down to the supraspinous ligament, the pain medicine interventionalist places electrodes into the epidural space through two curve-tipped needles. “I arranged the configuration so we can talk across the electrodes and from top to bottom,” says Dunbar, who performs the procedure at Baptist East. The leads are tunneled under the skin to a generator usually placed in the buttock region. The device is activated and tested in the operating room before the incisions are closed. The ideal patients for this new device are those with back and leg pain or neck and arm pain, and those that have failed other treatments. While this is not typically the first line of treatment, Dunbar says, “We’re moving so quickly now [with the technology] that you have to think about this earlier and earlier in the treatment algorithm, that maybe you shouldn’t wait until they’ve had three spine surgeries and they’re still having pain before you consider stimulation.” One of the contraindications for any implantable stimulator is if the spine is unstable. Dunbar cautions that AdaptiveStim is not a replacement for orthopedic surgery or neurosurgery. One of the major benefits of AdaptiveStim and implantable stimulators in general, is that they are drugless systems. Controlled substances are a hot button issue locally, in the state legislature, and on a national scale. “I write a lot of prescription narcotics, and when I write the first one, I think to myself, ‘I’m never going to get them off those narcotics.’ With the stimulator we have gotten several people off the narcotics, lowered their pain scores, and made them more functional, and they’re our best patients,” says Dunbar. A 30-year veteran in pain management, Dunbar’s practice, the Baptist Center for Pain Control at Baptist Eastpoint, sees patients from ages 16 to 100 with acute and chronic pain. He emphasizes that caring for the whole patient and interfacing with referring physicians and surgeons is critical to optimal patient care. 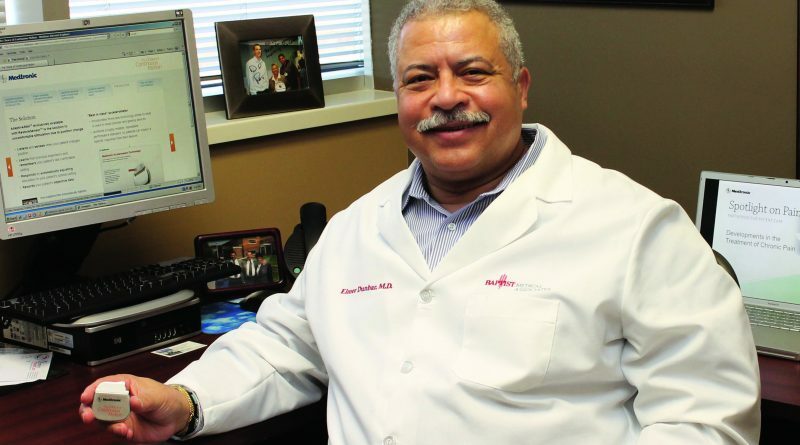 In addition to implantable stimulators, he offers injections, implantable pain pumps and spinal catheter systems. He is also an associate clinical professor at the University of Louisville and participates in research studies, including an upcoming project seeking to demonstrate that pain management techniques for severe cancer pain can successfully allow patients to withstand more rounds of chemotherapy and radiation, therefore improving survival rates. Dunbar believes in the incredible potential of pain medicine devices given the accelerated rate of technology in medicine today. So what’s next? “I predict they’ll figure out how to program [the neurostimulator] through your cell phone,” he says.